Hollenfells, Luxembourg (28 March 2018) – ECOLISE member organisations have reiterated their call on policy makers from the local to the European level to recognise and support the vital role that grassroots organisations are playing in the transition to a healthy and sustainable zero-carbon society. The 43 leading networks and organisations supporting community-led initiatives for climate change and sustainability, that together make up ECOLISE, were gathered at the annual ECOLISE General Assembly in Hollenfells, Luxembourg. “Thousands of communities across Europe are experimenting in new ways of living that are in harmony with the earth and provide simple, innovative solutions for decarbonising our lives,” said Robert Hall, president of ECOLISE, the European network for community-led initiatives on climate change and sustainability. All 43 organisations represented reaffirmed their commitment to collaborate, through ECOLISE, to bring about the changes needed to support grassroots initiatives. Participants came from 18 European countries – Austria, Belgium, Croatia, Denmark, France, Germany, Ireland, Italy, Luxembourg, the Netherlands, Poland, Portugal, Romania, Slovenia, Spain, Sweden, Switzerland and the UK – as well as visitors from the community-led movements for climate change and sustainability in the USA, and were hosted by ECOLISE member organisation CELL, the Centre for Ecological Learning Luxembourg. They included representatives of national and international networks of community-led organisations from the Transition, ecovillage and permaculture movements, as well as University researchers and educators for sustainability. 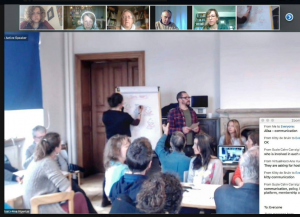 The gathering in Luxembourg was a so-called blended meeting – with participants present both physically and online – thanks to the use of freely-available online meeting technology. Creative meeting facilitation and participatory decision-making techniques, which are an integral part of the culture of the grassroots movement, were also used throughout the assembly. Last year, ECOLISE launched the first European Day of Sustainable Communities and is this year once again facilitating the event on 22 September 2018. The day provides an opportunity for grassroots community initiatives to showcase the work that they are doing, and to engage with policy makers at all levels. A conference on 20 September in Brussels, co-hosted with the European Economic and Social Committee (EESC), will be a focal point for engaging with policy makers.